From 7 years of age. You have the choice of three shows that can be performed to the sound of the chabreta, small pipes from Limousin. Jean-Marie Caunet will play traditional and contemporary folk music on them. You will find bits of everything in here so take your pick of traditional tales and riddles. You will meet lo pitit peseu (the pea) who tries to escape a dull destiny by throwing himself in the path of the pennyless. You will learn that lions used to reign over Limousin and that only the pitit greu (the cricket) dared challenge that feline king. The right weather to follow the paths and hedges of the Limousin country. A walk that will make you breathless going up our tuquets or get you stuck in the mud of our molieras (that will be rather difficult if we are sitting comfortably in the village hall chairs, but let’s hear no more about it…), a walk to go exploring the little creatures’world of wood and meadows, be they feathered or coated, two or four-legged. Creatures that speak – in the native language, of course ! – and out of so many lovely true-to-life stories, help create a mythology. A village that has nevertheless attracted the attention of God himself, so peculiar is its relationship to planets. And don’t you believe they’re the only ones in Limousin! 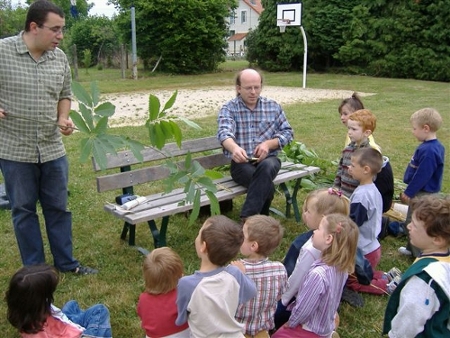 This small workshop is held in the heart of the countryside of course (preferably in the spring) and can also be an opportunity for children to hear a few Limousin traditional tales in which they’ll meet un greu (a cricket) full of fighting spirit, dogs in search of a king and a pea rich in human qualities. An activity around the toponymic heritage of our Limousin territories and its ensuing linguistic, historic and cultural interpretation. These activities can be held indoors or, better still, during toponymic strolls in the heart of the countryside where local toponyms will be traced in the natural and human landscapes come across.